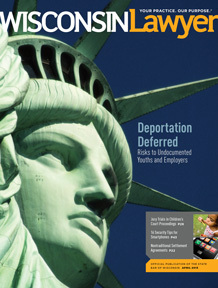 Deferred Action for Childhood Arrival, a new immigration initiative, may provide temporary deportation relief for undocumented youths, but the application process might also increase the risk of being deported or terminated from employment. Many courts and litigation attorneys view nontraditional settlement agreements like Mary Carter and loan receipt agreements with mistrust. But such agreements, when properly structured, can promote more efficient settlement of certain lawsuits. Jury trials in CHIPS, JIPS, and TPR proceedings, although a statutory entitlement, do little to promote the judicial systems goal of fostering and protecting the best interests of children. Kevin Klein describes what a State Bar president really does and how he does it. The Wisconsin Equal Justice Conference showed creative solutions help provide access to justice, says George Brown. Robert Denney explores issues surrounding this trending law firm business structure. It is okay to share space, just be sure to protect client confidentiality, says Dean Dietrich. Don't risk a loss of insurance coverage, warns Tom Watson. Report a potential problem right away. Sharon Nelson and John Simek say it's vital that lawyers protect smartphone contents. Law firms should continue to focus on clients' best interests, says Jay Rothman, not on investors' financial goals.